The world of apps (short for application, meaning software) is continuing to both grow and change, becoming a bigger part of the B2B world. Email service providers should take note. These marketing apps are going to become a competitive advantage for the ESPs…if corralled into a marketplace. Although it made us laugh for a while, “There’s an app for that” is now an old joke for consumers. We’ve moved past the funny notion of apps multiplying like breeding rabbits and into apps as a necessary part of everyday life. The same will become true for marketing professionals. What is a marketing software marketplace? A marketplace is a central location where third-party vendors can offer downloads of plugins and software they’ve developed to enhance an existing technology or platform. Salesforce.com led the way in 2005 when they launched the Salesforce Appexchange. Although Salesforce.com was already a force to be reckoned with, the apps marketplace made their marketing platform even more powerful than it was. Think about apps and you probably think B2C and picture the ones offered on your phone in that “marketplace.” Now think about that same kind of marketplace but for a B2B world, offered not on a smart phone but a website. This is the scenario that’s becoming more common, as leading companies jump on the “there’s an app for that” bandwagon. One in five top companies in the U.S. now operates an apps marketplace. Of these, studies show third-party Software-as-a-Service (SaaS) apps are outpacing their mobile counterparts (the former being B2B oriented and the latter typically being geared toward the consumer market). And of all the apps marketplaces now out there for your perusing pleasure, 43% belong to technology companies. Clearly, the “app for that” mentality is becoming the norm in the business world too. Should ESPs offer an apps marketplace? Despite the fact that 43% of the companies offering an apps marketplace are technology-based, not every email service provider offers such a marketplace for third party plug-in software… yet. It could be that more will because there are hundreds of Email Service Providers. And in my opinion, more should. It’s really not the ESP’s place to build integrations, but customers quite often have unique needs a generic platform can’t meet. Offering a place to sell to targeted customers encourages third-party integration by others. A big plus is making the integration with an ESP quick and easy. It’s a value-add for the ESP, because they can offer much more to their customer base. It gives the ESP platform a lot of extra development power and insight. The ESP’s platform becomes richer, more powerful, maybe even easier to use, and more appealing to potential customers. Offering an apps marketplace is going to be a game changer for email service providers, providing a competitive edge by offering their customers integrated applications that build on the platform for ever more powerful marketing. Not every company can offer a marketplace, because you need a big enough user base to justify the cost. However, many smaller companies can benefit because they can build solutions to be offered elsewhere, via the marketplace, and that’s what leads to the win-win: The big company (in this case, the ESP) can offer ways to enhance their product offerings, while the smaller company can reach a broader base of potential customers by building and offering a useful application that integrates with the ESP’s platform. If you’ve ever wished for a special kind of functionality from or integration with your ESP’s platform, it might exist already…or perhaps it soon will. Just what can you find at an apps marketplace? Consider the 75+ apps to choose from the SalesForce Marketing cloud (ExactTarget)’s HubExchange marketplace as an example. The variety can be both deep and broad. Innovation often comes from these apps, as they form the application layer of the marketing software. All applications are built to work with the ESP platform, eliminating the need to call in the IT department to build an API integration. It can drastically reducing the time to implement your marketing software. At ClickMail we have some experience with apps on the developers side. We had already decided to develop an email analytics tooling called eMVision. It is an application that enables deeper insight into email analytics, build upon the power of Tableau Software’s visual reporting software. When ExactTarget (now called SalesForce Marketing Cloud) announced they were launching their HubExchange, it validated our decision to create eMVision and gave us a targeted marketplace for promoting it to their users. With hundreds of ESPs in existence, probably not every single email service provider needs to offer an apps marketplace, or at least not on the scale that SalesForce Marketing Cloud does. But there’s no denying the benefits of doing so, for the ESP, the customer and the third-party vendor. 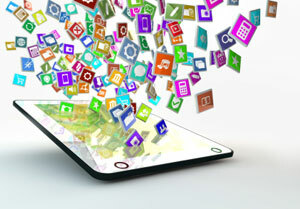 Having an apps marketplace will be a game changer in the marketing software ecosystem in the very near future.